Q. Are CVS and Target pharmacies part of TRICARE’s retail network? A. No. If you get your prescription filled at a CVS or Target pharmacy you will pay for the full cost upfront and have to file a claim for partial reimbursement after you meet your deductible. Visit the costs page for details. Your prescription costs depend on who you are, where you fill your prescription and the type of drug. You can get prescriptions filled from any pharmacy at no cost. • You may be required to pay up front for prescriptions from network and non-network pharmacies. • You’ll get a full reimbursement when you file a claim with Express Scripts. 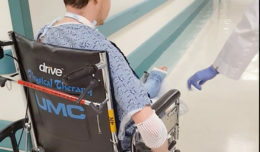 • Your provider must establish medical necessity for you to get non-formulary drugs A drug in a therapeutic class that isn’t as clinically or cost-effective as other drugs in the same class. You pay a higher cost share for these drugs. at no cost. • Get up to a 90-day supply of most prescription drugs. • Get up to a 30-day supply of most prescription drugs. If you want a 90-day supply from your network pharmacy, you’ll pay the cost for each 30-day supply. For example, a 90-day supply of a generic drug will cost $30. • Some non-formulary drugs are only covered through Home Delivery. Check with Express Scripts before filling prescriptions for non-formulary drugs at a retail network pharmacy. You’ll pay more to get your prescription filled at non-network and overseas retail pharmacies. • You may need to pay up front and file a claim for reimbursement. 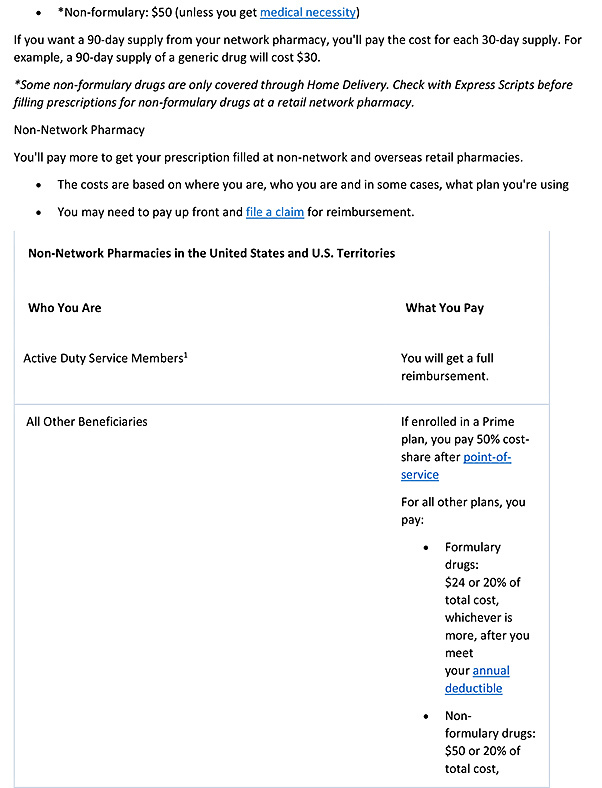 Non-Network Pharmacies in the United States and U.S. TerritoriesWho You Are What You PayActive Duty Service MembersYou will get a full reimbursement. All Other BeneficiariesIf enrolled in a Prime plan, you pay 50 percent cost-share after point-of-service. 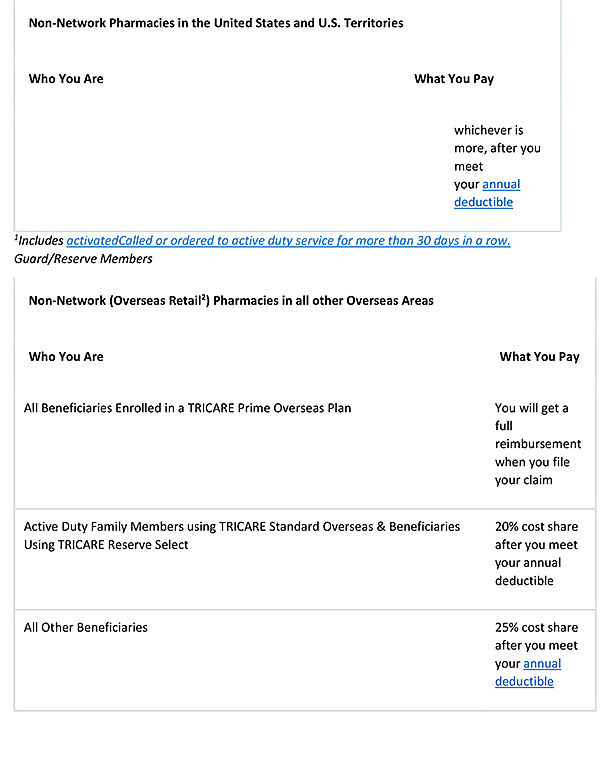 Non-Network (Overseas Retail2) Pharmacies in all other Overseas AreasWho You Are What You PayAll Beneficiaries Enrolled in a TRICARE Prime Overseas PlanYou will get a full reimbursement when you file your claimActive Duty Family Members using TRICARE Standard Overseas & Beneficiaries Using TRICARE Reserve Select20 percent cost share after you meet your annual deductibleAll Other Beneficiaries25 percent cost share after you meet your annual deductible.